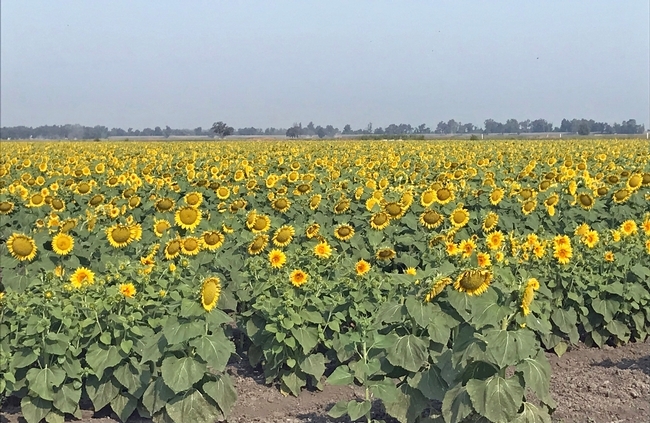 A new study on the costs and returns of producing hybrid sunflower seed in the Sacramento Valley has been released by the UC Agriculture and Natural Resources' Agricultural Issues Center for farmers who are considering growing hybrid sunflower seeds. “Although the acreage is relatively small – about 50,000 acres in the Sacramento Valley – hybrid sunflower seed is an important crop because California growers produce the seed for planting stock, destined to be planted in many areas around the world for oilseed and confectionary snack food markets,” said Sarah Light, UC Cooperative Extension agronomy advisor and co-author of the cost study. Authors Rachael Long, Mariano Galla and Light received input and reviews from fellow UC Cooperative Extension farm advisors and agricultural industry cooperators for the study, which is based on a typical farm in the Sacramento Valley producing field and orchard crops. “One thing new in our cost study is that it's based on a crop that is irrigated with subsurface drip as opposed to flood,” Long said. The study estimates the cost of hybrid sunflower seed production on 200 acres as part of a row crop rotation, using subsurface drip irrigation. The subsurface drip irrigation tape is replaced every seven years. Annually, 15 percent, or 30 acres, of the subsurface drip tape is replaced. To avoid cross-pollination with other sunflower varieties, hybrid sunflower seed production requires at least a 1.25-mile field isolation or different planting times. In this study, male sunflower seed is planted in three rows on a single 5-foot bed and female seed is planted in two rows on three 5-foot beds. The field ratio is 25 percent male parent lines to 75 percent female parent lines. With two hives per acre, honey bees are used to cross-pollinate between the parent lines. The male lines are destroyed after pollination to prevent seed contamination of the female lines. The authors used current production practices to identify costs for the sunflower crop, including material inputs and cash and non-cash overhead. The study includes tables that show profits over a range of prices and net yields, monthly cash costs, costs and returns per acre, hourly equipment costs, and the whole farm annual equipment, investment and business overhead costs. The new study, “Sample Costs to Produce Sunflowers for Hybrid Seed in the Sacramento Valley – 2018,” can be downloaded for free from the UC Davis Department of Agricultural and Resource Economics website at http://coststudies.ucdavis.edu. Sample cost of production studies for many other commodities are also available at the website. For additional information or an explanation of the calculations used in the studies, contact the Agricultural Issues Center at (530) 752-4651 or UC Cooperative Extension advisors Rachael Long at rflong@ucanr.edu, Sarah Light at selight@ucanr.edu, or Mariano Galla at mfgalla@ucanr.edu. 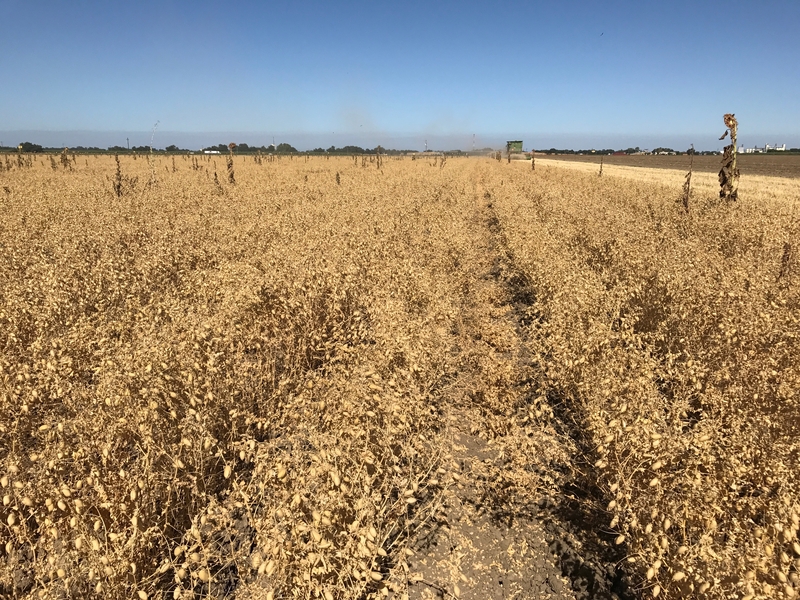 Garbanzo beans mature in June and are harvested in July. 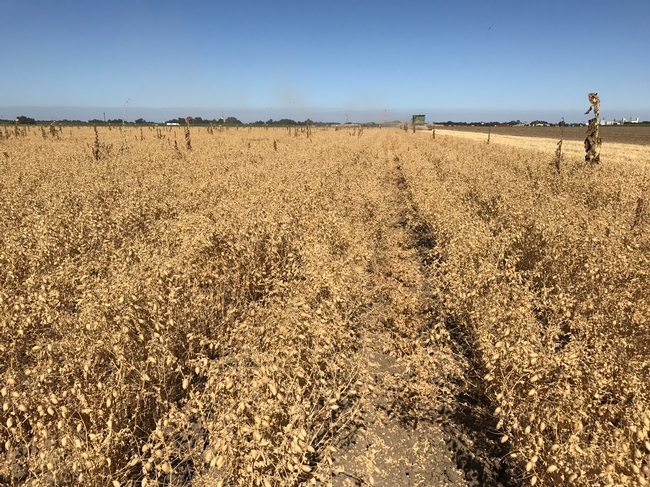 The UC Agriculture and Natural Resources' Agricultural Issues Center has released two new studies on the estimated costs and returns of producing garbanzo beans, also known as chick peas, in the Sacramento and San Joaquin Valleys. “Although acreage is relatively small, garbanzos are an important crop because California growers produce the large, cream-colored seed that's used for the canning industry, often used for garnishes for salads,” said Rachael Long, UC Cooperative Extension farm advisor serving Sacramento, Solano and Yolo counties. 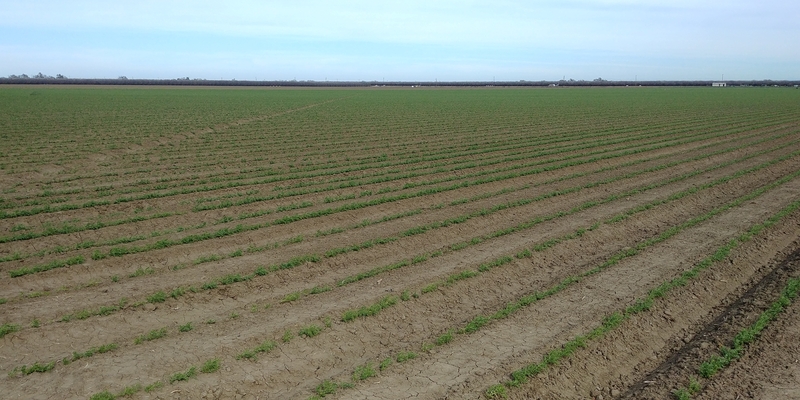 The studies estimate the cost of producing garbanzo beans on 200 acres as part of a row crop rotation, using subsurface drip irrigation. A three-row bed tillage implement shallowly chisels, tills and reshapes the beds, avoiding disturbance of the buried drip tape left in place. Planting of seed treated for fungal and seedling diseases, Ascochyta rabiei, Rhizoctonia and Pythium, into residual soil moisture occurs in December. Seeding rates for the garbanzo beans are 85 pounds per acre. In the San Joaquin Valley, garbanzo beans are typically planted in the fall or winter. Input and reviews were provided by UC ANR Cooperative Extension farm advisors and other agricultural associates. Assumptions used to identify current costs for the garbanzo bean crop, material inputs, cash and non-cash overhead. A ranging analysis table shows profits over a range of prices and yields. Other tables show the monthly cash costs, the costs and returns per acre, hourly equipment costs, and the whole farm annual equipment, investment and business overhead costs. “The importance of these studies right now is that they are currently being used to help secure USDA crop insurance for garbanzo production, expected in 2020,” Long said. Both studies can be downloaded from the UC Davis Department of Agricultural and Resource Economics website at http://coststudies.ucdavis.edu. Sample cost of production studies for many other commodities are also available at the website. For additional information or an explanation of the calculations used in the studies, contact the Agricultural Issues Center at (530) 752-4651 or the local UCCE Farm Advisors; Sarah Light, selight@ucanr.edu, Rachael Long, rflong@ucanr.edu, Michelle Leinfelder-Miles, mmleinfeldermiles@ucanr.edu, or Nicholas E. Clark, neclark@ucanr.edu. 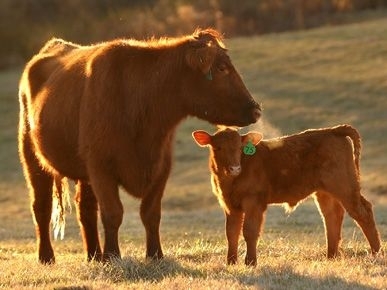 A red angus cow grazes in a pasture with her calf. The cattle industry in California has undergone dramatic changes over the last few decades. International competition and opportunities, new regulatory requirements, fluctuating feed costs, changing consumer demand, economies of scale and competing land uses all affect the bottomline in cattle ranching. Ranchers have experienced increasing production costs while revenue has not kept pace with costs. To help ranchers make business decisions, new cost studies for beef cattle production have been released by UC ANR Agricultural Issues Center and UC Cooperative Extension. "These studies are useful to new and experienced ranchers, lenders and other agribusiness companies, as well as government officials, researcher and students who want to know basics of ranch practices and the costs and returns that can be expected for a well-managed operation,” said Daniel Sumner, director of the UC Agricultural Issues Center. “The studies show ranges of net returns under alternative price scenarios to help indicate sensitivity of returns to cattle market conditions." The analyses are based on a hypothetical well-managed ranching operation using practices common to the northern Sacramento Valley. The three studies are based on a herd of 300 cows and bred heifers, 60 yearling heifers and 15 bulls. An 11 percent cull rate is applied to the herd. An 89 percent calf crop with three percent mortality before weaning is assumed. All rangeland and pasture is rented per animal unit month. Ranging analysis tables show net revenue over a range of prices. The costs, materials and operations shown in this study will not apply to all ranches. Ranchers, UC Cooperative Extension farm advisors, and other agricultural associates provided input and reviewed the methods and findings of the study. Free copies of these studies and other sample cost of production studies for additional commodities are also available. To download the cost studies, visit the UC Davis Department of Agricultural and Resource Economics website at https://coststudies.ucdavis.edu. The cost studies program is funded by the UC Agricultural Issues Center and UC Cooperative Extension, both of which are part of the UC Division of Agriculture and Natural Resources, and the UC Davis Department of Agricultural and Resource Economics. For more information or an explanation of the calculations used in the studies, contact Donald Stewart at the Agricultural Issues Center at (530) 752-4651 or destewart@ucdavis.edu; Larry Forero, UC Cooperative Extension farm advisor for Shasta and Trinity counties, at lcforero@ucanr.edu, or Jeff Stackhouse, UC Cooperative Extension farm advisor for Humboldt and Del Norte counties, at jwstackhouse@ucanr.edu. NOTE: Corrections were made on July 19, 2017, to “2017 Beef Cattle Yearling/Stocker Production in the Sacramento Valley” and “2017 Beef Cattle Finished on Grass in the Sacramento Valley” to show interest calculated for 6 months as stated in the narratives of both studies, instead of 12 months. The cost study for strawberry production notes that in 2016 new minimum wage and overtime laws were passed in California. Many growers already pay more than the current state minimum wage, but may be affected by the overtime law. 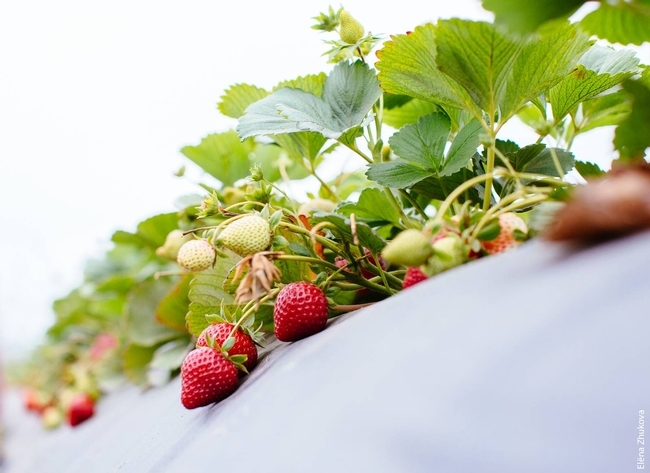 A new costs and returns study for strawberries has been released by UC Agricultural Issues Center and UC Cooperative Extension to help growers make farm management decisions. The study presents sample costs to produce and harvest strawberries for fresh market in Santa Cruz andMonterey counties. The cost study is in Spanish at http://ucanr.edu/files/269041.pdf. “The study also has an expanded section on labor, which includes information on California's new minimum wage and overtime laws,” said Laura Tourte, UC Cooperative Extension farm management advisor in Santa Cruz, Monterey and San Benito counties, who co-authored the study. The analysis is based upon a hypothetical well-managed farming operation using practices common to the Central Coast region. The costs, materials, and practices shown in this study will not apply to all farms. Growers, UC ANR Cooperative Extension farm advisors and other agricultural associates provided input and reviewed the methods and findings of the study. The study assumes a fairly flat farm operation of 50 contiguous acres of rented land. Strawberries are planted on 45 acres. From April through early October, the crop is harvested by hand and packed into trays containing eight 1-pound clamshells. Harvest peaks in June and July. The authors describe the assumptions used to identify current costs for production material inputs, cash and non-cash overhead. Ranging analysis tables show net profits over a range of prices and yields. Other tables show the monthly cash costs, the costs and returns per acre, hourly equipment costs, and the whole farm annual equipment, investment and business overhead costs. The cost and returns studies program is funded by the UC Agricultural Issues Center and UC Cooperative Extension – both of which are part of the UC Division of Agriculture and Natural Resources – and the UC Davis Department of Agricultural and Resource Economics. For additional information or an explanation of the calculations used in the study, contact the UC Agricultural Issues Center at (530) 752-4651, Mark Bolda, UC Cooperative Extension advisor in Santa Cruz County, at (831) 763-8025 or Tourte at (831) 763-8005. UPDATED Sept. 13, 2017, to add link to Spanish version of cost study. UC Agricultural Issues Center has released a new study on the cost and returns of establishing a vineyard and producing winegrapes in the northern San Joaquin Valley. 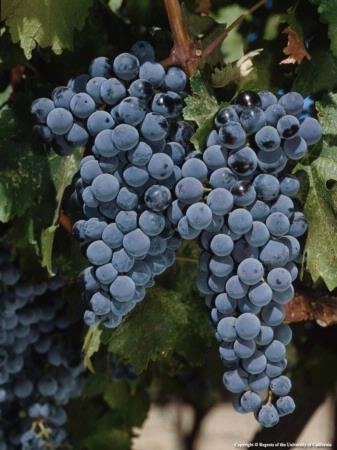 The cultural practices described represent the establishment and production operations, as well as materials of a well-managed cabernet sauvignon vineyard in this region. The costs, materials, and practices shown in this study will not apply to all farms. Growers, UC ANR Cooperative Extension farm advisors, and other agricultural associates provided input and reviewed the methods and findings of the study. The hypothetical 200-contiguous-acre farm is located in Crush District 11, which includes San Joaquin and Sacramento counties. The economic life of the grower-owned-and-operated cabernet sauvignon vineyard used in this cost analysis is 25 years. Vine management includes hand operations such as pruning, suckering, shoot removal and positioning. The grapevines are mechanically trimmed and harvested. This study does not include cluster thinning, but other winegrape varieties may require thinning due to compactness. The authors describe the assumptions used to identify current costs for establishment and production of the winegrapes, material inputs, cash and non-cash overhead. Ranging analysis tables show profits over a range of prices and yields. Other tables show the monthly cash costs, the costs and returns per acre, hourly equipment costs, and the whole farm annual equipment, investment and business overhead costs. Free copies of this study and sample cost-of-production studies for many other commodities are available. To download the cost studies, visit the UC Davis Department of Agricultural and Resource Economics website at http://coststudies.ucdavis.edu. For additional information or an explanation of the calculations used in the studies, contact Jeremy Murdock at the Agricultural Issues Center at (530) 752-4651 or jmmurdock@ucdavis.edu or UC Cooperative Extension San Joaquin County farm advisor Paul Verdegaal at psverdegaal@ucanr.edu.